The ring muscle-up is one of those exercises that when you land it, you feel like you've made it big. A notoriously difficult exercise, muscle ups can take years to perfect. But unless you're regularly practising, nothing's going to happen. 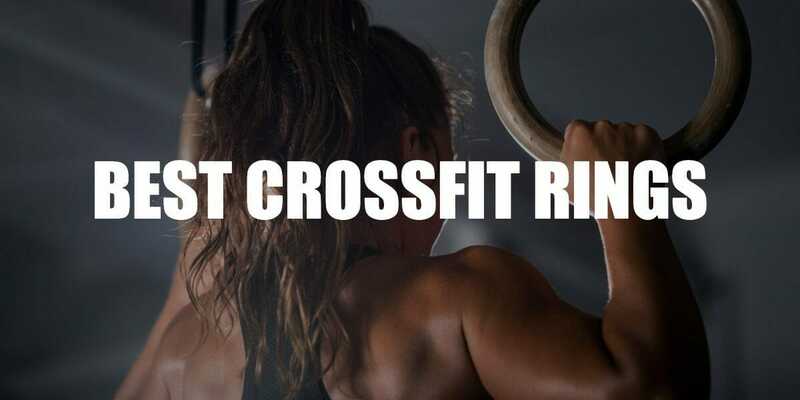 Heading to the CrossFit box just to train rings every day might not be the best use of your time. So why not get your own wooden rings? 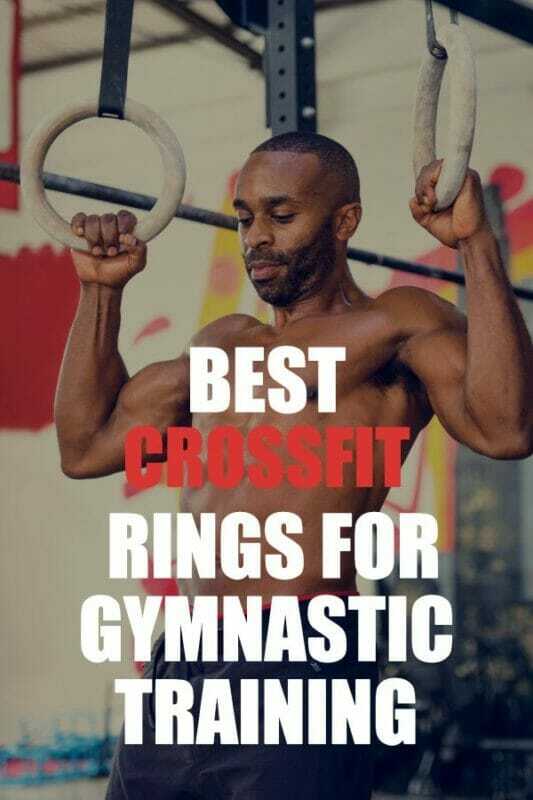 CrossFit and gymnastic rings are inexpensive, lightweight and super versatile. All you need is a bar, branch or some kind of high attachment point to set up one of the best upper body gyms on earth. An essential piece of CrossFit equipment for people that want to master the muscle up. 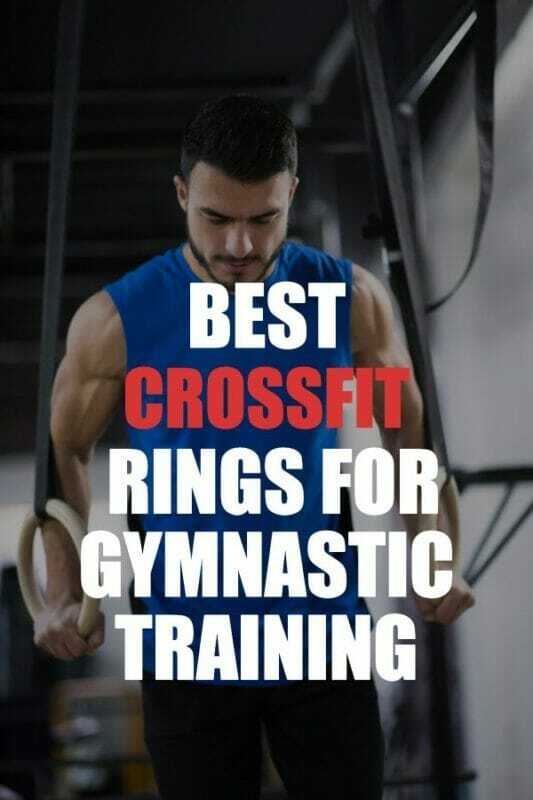 Gymnastic training CrossFit rings are one of the best upper body strength tools money can buy. 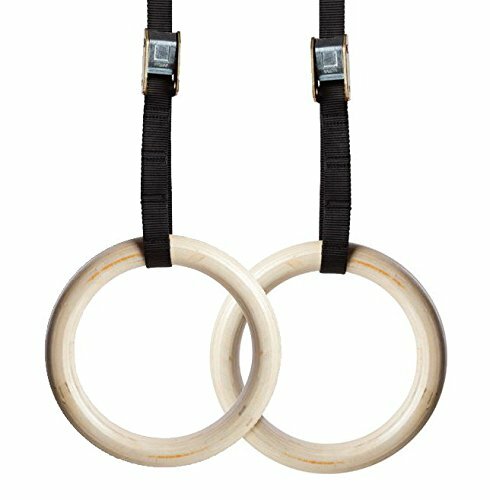 The Iron Bull Strength Wooden Gymnastics Rings with Adjustable Straps are a fine choice to get you started with ring workouts. A few weeks on these solid performers and you'll be making the rest of the gym jealous with your show off moves 😉. I still remember the first time I learned to do a ring muscle up. It was an exhilarating feeling that I wish I had every time. Although I still thoroughly enjoy the feeling of performing a good ring muscle up, there's nothing like the first time. How did I get it? Well, practising for 5 minutes every day helped. I didn't head to the gym every day but I had my rings attached to a tree near my apartment where i could practise. A little every day is better than a lot of practice all at the same time. Muscle fatigue and injury are real dangers when it comes to intense workouts and movements involving rings. There's a reason why gymnasts have physqiues that almost everyone envies. Gymnastics is tough and requires extraordinary strength and agility to reach the top levels. But we all don't aspire to compete in the Olympics in the gymnastics category (or any category). Hitting a ring dip or muscle-up is the end goal of many. Make sure to use a proper false grip. The knobbly bit at the base of your hand, where it meets the wrist, should be on the ring. When you start to pull try to make the movement smooth. Crunch into a slight V shape at the top to help push your head through the straps and get your elbows over the rings. Press out while keeping the rings in close. Ring workouts are heavily biased towards the upper body and core. it's hard to train the legs with rings but your lower body will still get a decent isometric strength training workout. For the arms, back, pecs, shoulders, and abdominal muscles, there are few exercises or pieces of exercise equipment that hit all the right muscles better than a ring workout. Calisthenics are a fantastic way to get in shape. And it's never too old to get into the world of fluid bar and ring movements and gymnastics tricks. Great for building chest, shoulder, arm, and core strength. Nothing beats the physique of a well-sculpted gymnast. With a set of gymnastic rings, you won't need an entire gym for upper body and core workouts. Pack them into your travel luggage (even carry-on bags) for a portable CrossFit gym wherever you go. Procircle gymnastic rings are superior to other brands thanks to increased thickness and diameter of rings, higher quality materials in the strap and buckle, and a tried and tested brand. Wooden gymnastic rings are better than plastic as they suffer less slippage. Wide rings are better for comfort. All rings are portable and can be used almost anywhere you can find an overhead bar, pole, tree branch, or ceiling hang. Lightweight and quality design means you won't have to worry about weight when transporting your rings and you'll be using them for years to come. Hang the rings in your garage, apartment, garden, or local gym. I like to travel and I don't like to lose fitness and strength. For this reason, my CrossFit rings are an essential part of my travel gear. Yeah, it's 4lbs ( nearly 2KG) of extra weight in my bag. But it's like having my own gym come along with me. Not every town has a CrossFit box. Not every CrossFit box has rings (true, I've seen a few with no rings, rowers, or bikes). 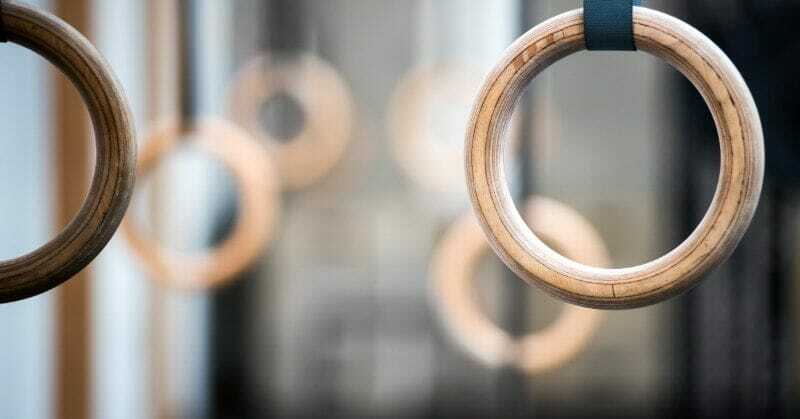 With few moving parts, wooden CrossFit rings should be easy to buy. But quality does matter. You don't want to be suspended upside down when a strap breaks or ring actually snaps. The latter is unlikely, but never say never! The better the straps, buckles, and construction, the less chance you will need to replace your rings, or more importantly, the less chance there is of something going wrong. 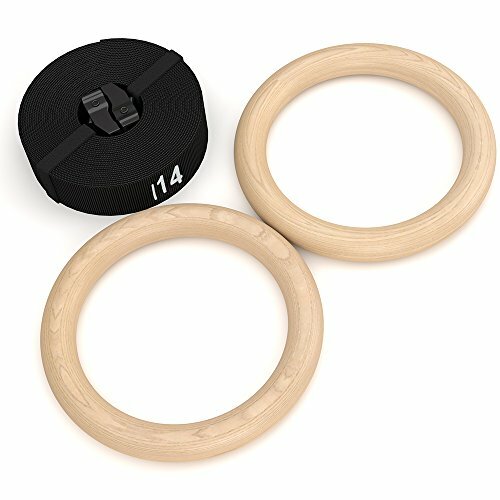 At the lower end of the scale, the NEXPro Wood Gymnastic Ring for Crossfit are a decent choice for bargain hunters. With 15ft straps, there's plenty of room to hang your rings. I bought these rings and although it's clear that the buckles in particular are not the highest quality, the rings served their purpose and are perfectly acceptable for the price. A few reviewers on Amazon had some issues with the straps slipping through the buckles. These rings are fine for infrequent use. 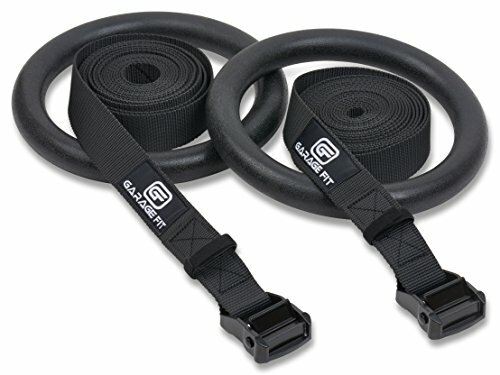 Garage Fit Plastic Gymnastic Rings are heavy duty rings that will last you for years. My only issue is that they are made from plastic. Yes, they will take a lot of punishment. The straps and buckle should last a lifetime. And the biggest selling price of these rings is the price. But I find plastic to be too slippy for a real ring workout. The Garage Fit rings come in different colors so you can customize your workout gear to suit your style. The Iron Bull Strength rings are a solid choice for everyone from beginner to advanced. Super strong steel buckles and an extra wide strap makes this ring set a solid performer. 1-year warranty.